While a successful clinical documentation improvement (CDI) team can be composed of clinical nurses or be solely reliant on coders, why not utilize both sets of professionals to maximize outcomes? Many coders can work offsite and are capable of querying physicians via e-mail or an option in the EMR. The general consensus, however, is that convenience does not trump the need for a professional relationship built on mutual respect and trust. While there are physicians who know and trust their department’s coding and billing team, that may not be the case with the hospital’s coders. Unless the physicians are hospital employees, they may be tempted to consider the facility’s data quality and reimbursement to be someone else’s problem. Quality indicators and core measures are second nature to the nursing staff, while the link between how documentation is coded and how quality is subsequently perceived is comparatively new in the coding department. However, today’s coders must be diligent in reporting hospital-acquired condition and present-on-admission codes as well as be experts on general coding rules and diagnosis-related group assignments. If they are remiss, there will be errors not only in reimbursement but also in core measures and case mix data, severity of illness and intensity of service reporting, and risk management. Nurses in a CDI role are likely adept at acquiring all documentation necessary for coders to capture and report key data elements as accurately as possible. However, don’t be misled into thinking this devalues coders’ role in CDI. Establishing a relationship between nurses, physicians, and midlevel providers is only the beginning. While clinical nurses are likely familiar with various medical staff and are often onsite to ask questions and get answers more easily, they are not always well-versed in coding and sequencing rules. On the other hand, coders are more likely to be introverts and less likely to interact personally with physicians. At some hospitals, coders never have one-on-one dialogue with medical providers. And yet it is the coders who know what documentation is needed to correctly report the patient’s severity of illness and the intensity of service provided by the facility. Coders know when it is unnecessary to query a physician for a condition that will ultimately have no effect on any critical reporting elements. Coders understand that if missing adjectives such as “acute” and “severe” are clinically supported, adding the term to patient documentation may drastically change one or more of the major data elements. While a nurse is likely to know exactly what the physician meant to say by documenting abnormal results and orders for focused treatment, that in itself can create a lost opportunity. If a nurse mentally translates terse documentation into more complete medical information, it can result in a subsequent failure to query for clarification. Coders, who can’t report what the physician meant to say, only what was actually documented, are acutely aware that implied documentation is still considered missing documentation. Why conjoin the two professions to boost clinical documentation? Why not let nurses handle ‘nurse work’ and leave coders in the office? If a CDI nurse reviewer is unaware of an important coding rule and a query is not performed while the patient is in the hospital, the likelihood of getting a physician to respond to a postdischarge query decreases proportionately to the length of the delay. If coding professionals are not involved until after discharge, the pressure to maintain productivity coupled with the decreased likelihood of receiving a response can discourage late queries. Play to the strengths of both groups. Instead of expecting nurses to ask physicians the right questions and coders to catch any missteps, place each group in the documentation trenches. A nurse’s clinical experience can help identify missing diagnoses based on the presence or absence of medical care and therapy. Nurses also are aware of how documentation affects quality reporting. Coding experts add meaningful queries and eliminate nonessential ones that demand physician response but won’t affect any critical outcomes such as payment, severity of illness, and risk of mortality reporting. Take it one step further. Instead of trying to teach nursing skills to coders and expecting nurses to learn all of the coding rules, pair up the coders and nurses. In the project’s early stages, assign both a coder and a nurse to the same admission. Before long, their close-knit communication will result in each professional being able to understand cases from both a clinical and coding perspective. Once nurses and coders are familiar with all the issues in the most common cases, they can tackle those solo and pair up only on more complex cases. Eventually, either should be able to handle basic patient types by themselves and recognize when to include their CDI partner in difficult or odd cases. This approach can resolve two obstacles inherent in either reviewer’s principal background. For coders, it is difficult enough to code what is there without trying to figure out the consequences if something not included was coded. 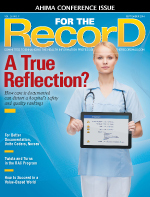 For nurses, it can be frustrating to know what’s really going on with a patient and then learn that the final coding has created a poor quality report or a core measures failure that could have been prevented by clearer physician documentation. To advance the arrangement, facilitate weekly meetings between the specialists to review a “problem chart of the week.” If time permits, schedule more frequent get-togethers. Have coders prepare the top three coding tips of the week based on their chart reviews. In turn, nurses can contribute a list of the top three clinical tips. Include both groups to create queries that are clinically correct yet compliant with coding rules. No one expects a carpenter to build a house using only a hammer and nails or a surgeon to operate without the instruments the procedure requires. In the same manner, a successful CDI program should enlist every applicable skill set throughout the hospital, including coding and nursing. From there, build a sound communication strategy to join the various skills together to create a circle of cooperation, trust, and excellent outcomes.